Bring a heavyweight to your kitchen with Verme's Knockout Collapsible Colander! This colander is the pound for pound champ in making draining and straining easy. A huge kitchen helper, allowing you to strain fruits, veggies, pasta and more. Whether your kitchen is big or small, with classic or modern decor, it nicely compliments and adds extra color to any kitchen. This will save you some much-needed space, while performing the tasks you need. Crafted with durable, non toxic and BPA free silicone and materials that are stain and odor resistant. Its sturdy base provides stable balance while rested on any countertop or sink. It also features ergonomic handles with comfortable grip for easy transferring of foods to any other container. 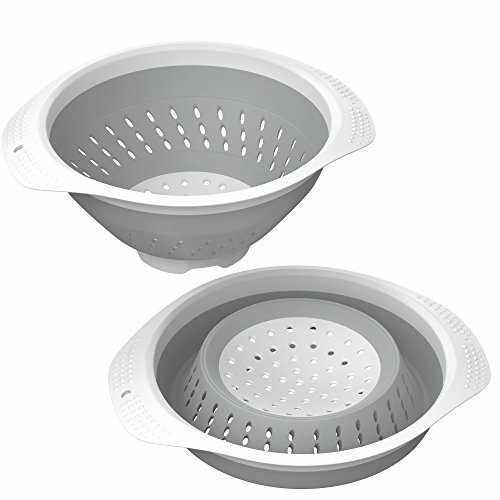 This heavy duty colander can withstand high temperatures, making it possible to immerse in hot water to quickly blanch foods like carrots, fresh lettuce, pasta, potatoes, shrimp and more. These will make your time in the kitchen easier, simpler and healthier. A staple to your cooking routine, and a great gift idea for new couples, professional cooks, college students and kitchen lovers with limited apartment space or home storage. Product Details and Care Materials: Silicone body, base Capacity: 5 quart (4.7L) Size: 12.5 inches long (31.7 cm) Collapsed height: 2 in (5 cm) Expanded height: 5 in (12.7 cm) Heat Safe up to 175A Degree BPA Free Handwash Only (top rack recommended) Do not put in microwave, oven, freezer or above a direct heat source..